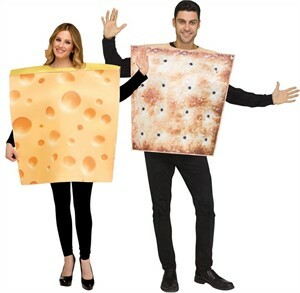 This Adult Cheese & Cracker Costume is a fun and adorable way to celebrate Halloween. Do you and your loved one go together like cheese and crackers, a.k.a. the greatest combination of any two things ever? When the two of you walk into the costume party together, no one will be able to contain their admiration at how cute and clever you are. Come with a plate of cheese and crackers for some fully committed fun. This costume consists of two tunics with high definition prints, one of a block of cheese and one of a cracker. The tunics are easy to put on and fit most adults. Who said Halloween shouldn't be a little bit salty and a little bit savory? Availability: This Adult Cheese & Cracker Costume takes approximately 1 business day to leave the warehouse plus transit time.